Kate and I came down to my parent's farm in eastern Ontario on December 23rd for our big get-together on the afternoon of the following day, with my sister and her husband and three children, my parents, and my sister's best friend Julie with boyfriend and his two daughters. A furious amount of activity. 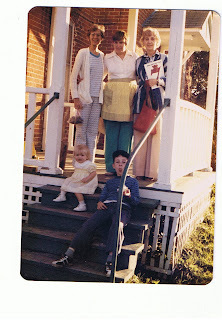 My sister's three children, all five and under, scurrying around the house, doing whatever small and adorable children do, and my own daughter, a week and a bit away from eighteen, quietly stepping aside to let them. It seems to be, these days, that after all the children leave, it just seems to get quieter and quieter in my parent's old farmhouse, somewhere between 120 and 140 years old now (the house, not my parents). 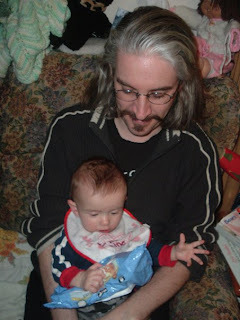 After Kate and I spent a few hours with my sister and her brood the previous night, I spent much of yesterday hanging out quietly, myself, with my little namesake, Duncan, who is just six months old. My sister's youngest (obviously), third and final child, he shares my birth name, and also my paternal grandfather's middle name, my grandfather called "John Duncan," so he wouldn't be confused with his older brother, John (ah, the Scots). John Duncan was also the first in many generations of our McLennans to not name his firstborn son John, calling my father (an only child), instead, Douglas Ian (Ian being a John derivative). I always enjoy these visits, but this one was a little more stressful than usual. I keep hoping that in 2009, I can fix all the things I did wrong in 2008. So far, I think it just might work out, but today I'm exhausted. This morning I took Kate back to Ottawa to her mother's house, and I spent the afternoon digging through old photographs, scanning them into the computer for various nefarious reasons. Why did it take me an hour to figure out the equipment? My mother is asleep in her chair in the living room, my father asleep upstairs. I go back to Ottawa tomorrow. The past few days have really taken their toll on me; where will I be in a year from now? Why do I feel so much older? Dusty in my parent's house, this is the old piano that becomes mine, once I have a residence big and somewhat permanent enough to keep it to Ottawa (you really aren't supposed to move pianos at all). It's been sitting for years in the front porch, despite whatever efforts on my part to get them to move it to another part of the house. Why must they keep it there? The board is probably wrecked by now, and it hasn't been tuned since the late 1980s. My maternal grandmother's parents bought it new for my grandmother in the 1920s or 1930s, so she could take lessons as a kid. 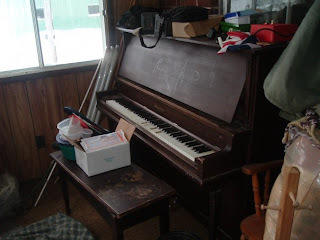 This is the same piano that moved from my great-grandparents house in Kemptville to ours in 1976, so I could begin what turned into thirteen years of lessons (my sister, I think, took two before she managed to convince our mother that she didn't want to do it anymore; she was always better at arguing than I was). The old piano has sat years, unused and untuned, but I am working to get a place, and restore it to good health again. Today I am going through photographs, and wondering what other things I have to do here before I head back to the city, and the article I should be writing, the novel I'm supposed to be finishing, the creative non-fiction book I think nearly complete. What else is there? And why does this break somehow not feel like break?